If the gangs don’t get you, the cold will. Survival is The Division’s second expansion, adding a new mode that dramatically changes how you play the game. As an apocalyptic blizzard batters New York, you find yourself stranded at the edge of the map with a basic pistol, green-level equipment, and an infection that’ll slowly kill you if you don’t keep it under control with medicine and painkillers. Your mission is to reach the Dark Zone, locate a potential cure for the Green Poison, and extract it (and yourself) by helicopter. Which would be easy if it wasn’t for the bitter cold, roaming gangs of powerful enemies, and other players who won’t think twice about killing you and stealing your beanie. In the main game, clothes don’t matter. Play it for a few hours and you’ll have so many vaguely similar-looking shirts and hats that you’ll stop caring about finding new ones. 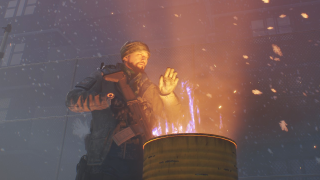 But one of my favourite features in Survival is how each piece of clothing now has a warmth rating, and dressing appropriately is key to surviving the merciless cold outside. It creates a meaningful system out of playing dress-up with your character, and suddenly finding a new trapper hat is something to celebrate, because it might raise your temperature by a few precious degrees. You can craft clothes at safehouses scattered around the map or loot them from fallen enemies and containers. But clothes only reduce the effects of the cold. To avoid freezing to death you have to keep an eye out for apartments, shops, and other buildings to escape into. Entering raises your temperature, offering some respite from the blizzard, but they can be hard to spot through the snow. You can also cower next to burning barrels to increase your temperature, but this is only a temporary solution. I love how different the weather makes the world feel. The howling wind, cars piled with snow, and distant lights shining through the white-out make for an incredibly atmospheric remix of the city. You can almost feel the cold biting at your face as you trudge through the storm. Another thing I like about Survival is how it levels the playing field. All 24 players begin with the same meagre supplies and basic gear, which means you don’t have to worry about being repeatedly murdered by some jerk who has a better gun or a few levels over you. You don’t even get to bring your abilities into Survival either: they have to be crafted from looted materials. And there’s no mini-map, which encourages careful and thorough exploration of your surroundings. It does a much better job in general of making New York feel like a dangerous, desperate place where supplies are precious than the main game, which never really feels that hazardous. It’s a genuine struggle for survival, and you will die many, many times as you get to grips with it. When you die you’re given a score based on how long you lasted, how many supplies you found, how many items you crafted, how many enemies you killed, and so on. And even if you didn’t make it to the Dark Zone and extract the antivirals, which can be extremely difficult, you’ll still get rewards for your troubles. I don’t normally have much patience for permadeath games, but whenever I died in Survival I felt the urge to immediately try again to see if I could get just a little further into the Dark Zone. Playing with friends is a much more effective way of completing the mission, especially when facing bullet-sponge elite enemies, but it’s perfectly enjoyable solo. There are too many survival games on PC, and when I heard Ubisoft was adding a survival mode to The Division I felt no urge to play it. But I’m glad I gave it a shot, because it’s surprisingly excellent. The cynic in me expected a lazy attempt to cash in on a popular genre, however it’s clear a lot of work has gone into making Survival a legitimate, worthwhile game mode. And while New York in the main game is little more than an elaborate, albeit extremely pretty, movie set to have gunfights in, Survival integrates the apocalyptic setting and wintry weather into the game’s systems in an exciting, integral way. I used to enjoy running around the streets and taking in the sights, but in Survival I feel a sense of unease and dread around every snow-choked corner.